What is String concatenation operator? What is String concatenation operators? That operator which is used to concatenate strings, columns and combination of columns and string into one expression or statement is called string concatenation operator. The "+" operator is used to concatenate the strings, columns, etc. 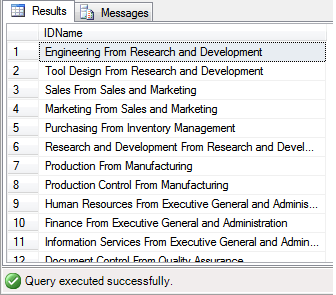 In the above example From is a string that is used in between the Name and GroupName column records. The + symbon is used to concatinate the columns with from keyword. In this chapter we have learned about String concatenation operators. In the next chapter you will learn about unary operater and its type.